Obviously this post is just another excuse for me to eat dessert for breakfast. Because I mean, when you think of yogurt, you think of breakfast. When you think of strawberries, you think of chocolate-covered strawberries. So when you think of strawberry yogurt, you think of dark chocolate-covered strawberry crepes. At least, that’s where my mind goes. And I am not in the least bit sorry about it. When Liberte invited me to come up with a recipe pairing their delicious, whole-milk yogurt with a decadent treat, I was ALL OVER IT. I mean, have you tried their yogurt? It’s truly the creme de la creme of yogurthood. It’s made without sugar substitutes, gelatin or preservatives so each bite is just plain, pure yogurty deliciousness. I’m pretty sure I fell in love with their strawberry flavor immediately. And then I went ahead and spooned it onto a dark chocolate crepe covered with a chocolate drizzle, homemade whipped cream and strawberries. To say that I had the most epic struggle of willpower in not eating the entire batch is the understatement of the century. I’ve grown up eating crepes and while my dad still makes the very best, I have to say this version gives his a run for its money. Tossing a handful of cocoa powder into the batter was one of the best things I’ve ever done in my whole life, and though I’m usually partial to the inclusion of jam or sour cream in my crepes, this yogurt-filled variation has quickly become a new favorite. I could eat this for dessert or for breakfast, really. Or as a snack. Or for dinner. Or for… well, you get the picture. This pairing is perfect for any time. 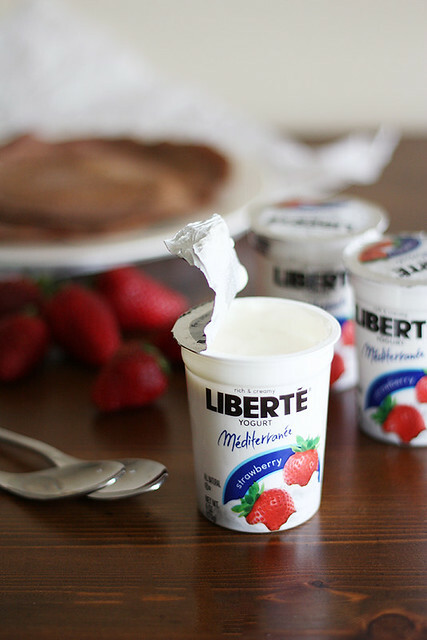 Disclosure: I received compensation by Liberte Yogurt for recipe development purposes. All opinions are my own. Aw yum! I don’t even know if Liberte yoghurt is sold here in Australia but the whole strawberry yoghurt and chocolate crepe combination sounds absolutely delicious. And you’re right, with yoghurt and fresh fruit, it’s definitely justifiable for breakfast! Healthy indeed! Giiiirl, please. This looks insane!! Loooove! laurasmess — You should definitely try it, even if you can’t find Liberte in your area. It’s SO good. Thanks for the comment! Dark chocolate crepes?? Such a great idea. I would love to use these in orange crepe suzette with the yoghurt. It is similar to greek? Have you ever tried to make a crepe Burrito? Like stuff the crepe with any kind of breakfast staple e.g balsamic strawberries, cereal, yoghurt. So heavenly I tell you. Chocolate and strawberry anything is a hit with me! These are making me hungry! Belinda — Ooo, yes, I grew up on a crepe burritos! Love them 🙂 As for the yogurt, it’s not really similar to Greek — it’s creamier and less tangy, but definitely just as delicious. Oh. my. goodness. I cannot imagine a better breakfast! I’ve never tried their yogurt before, but it sounds great – going to definitely pick it up next time! I love making crepes! I haven’t ventured into the flavored ones yet…. I must! 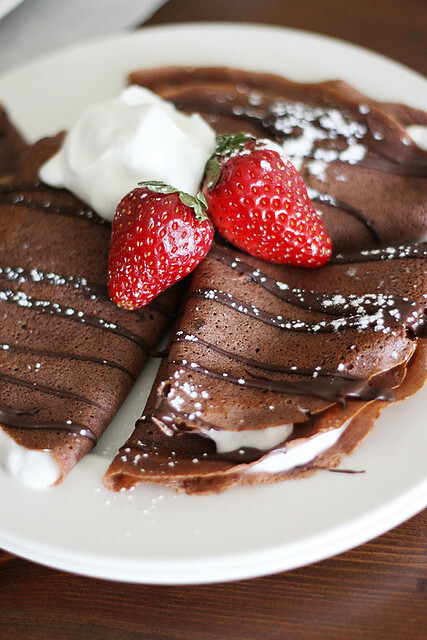 These chocolate crepes look amazing. I love the yogurt on the inside as filling, great idea! Stefanie — Ooooh, the flavored ones are AMAZING. You have to try them. It will change your life. YAY for dessert and breakfast! These crepes look delicious! You just took me to crepe heaven, *love* these! Seriously, these look amazing! I’m loving the addition of yogurt! Meagan — Yay indeed! 🙂 Thank you dear! Jessica — Thank you so much! The yogurt really makes the whole thing bonkers delicious. LOVE using yogurt as crepe filling; my favorite is thick green yogurt, powdered sugar, and fresh squeezed lemon juice. Oh and yeah, these chocolate crepes look amaaaaazing. These are the most delicious looking crepes, I want to try this recipe now! Tia — Mmm, your version of crepe filling sounds amazing! Going to have to try that soon, too. Rosie — You should totally try this recipe now! 🙂 Thanks! Yum! I’ve been wanting to make crepes for a while. These are inspiring. Plus I like the healthy twist with the yogurt. Dessert for breakfast: Always a good idea. The best idea, actually. Tiffany — You should definitely give crepes a try; they’re much easier to make than you’d think! wow! this looks ridiculously good! i love that yogurt you added in the middle. 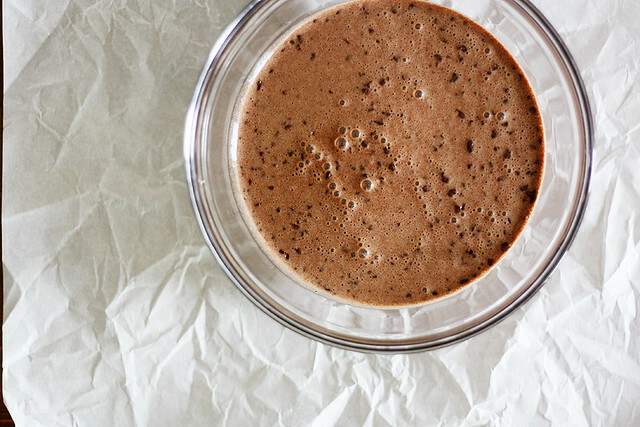 so much healthier than adding whipped cream. i’ve so got a chocolate craving now!! 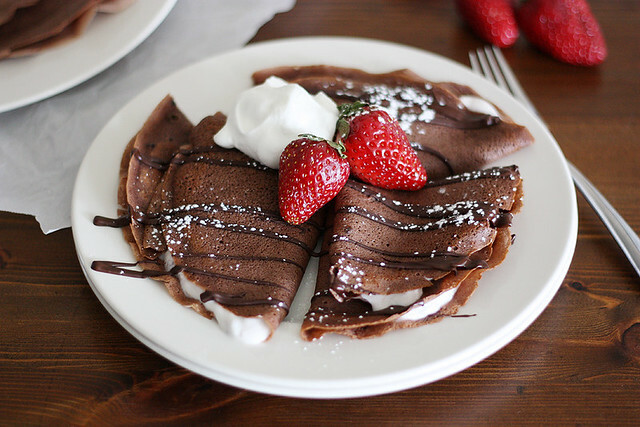 chocolate and strawberries are a great combination and i just love crepes! yum! and you have gorgeous photos. Julie — Oh well then never mind the giant dollop of whipped cream I heaped on top of my serving after I took these pictures… Still healthy because the yogurt was on the plate, right? 😉 Thanks, lady! what katie’s baking — Oh thank you so much! One of those moments I wish I could eat food through the computer screen, these look fantastic! I bet the yogurt is amazing in the crepes! Sooooooo…I’ll be over in 2.2 nano seconds! Holy deliciousness girlfriend! 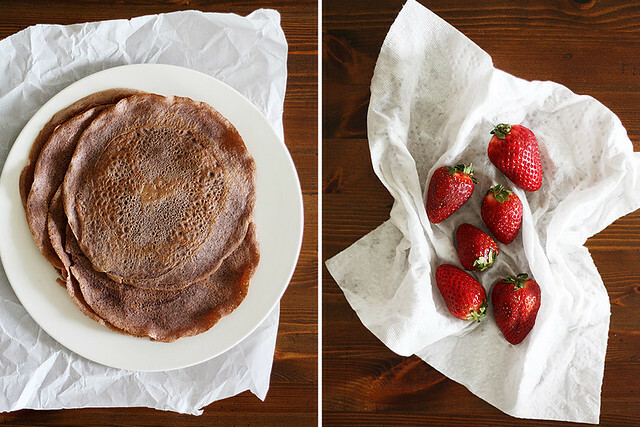 These are some seriously gorgeous crepes! Ah jeez, I MUST try the Creme de la creme of yogurts! It’s been far too long since I have had a crepe and dark chocolate with strawberry yogurt is exactly where I’d go! Great pairing, my dear! Have an awesome weekend! Julia — You really should try it! If you love yogurt, you will be obsessed with this stuff. Thanks, dear — and happy weekend to you, too! These chocolate crepes are stunning! I love crepe, especially those with strawberries and chocolate sauce. But yours sounds even better. I can’t wait to make them. Thanks for sharing. Lokness — Thank you so much! 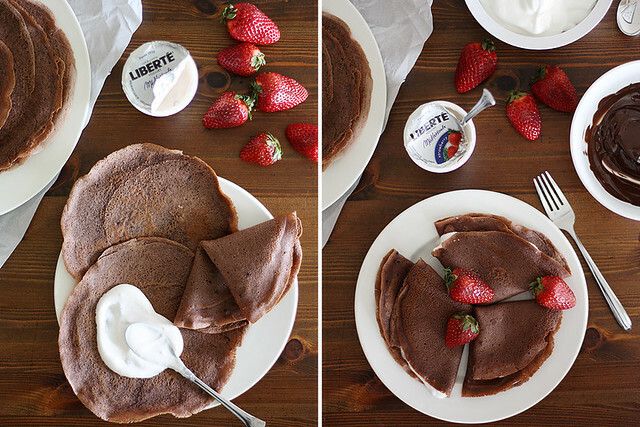 These crepes are so gorgeous, and I love the dark chocolate flavor! Wonderful recipe! Dessert for breakfast is ALWAYS a yes in my book. Especially if it involves chocolate!! 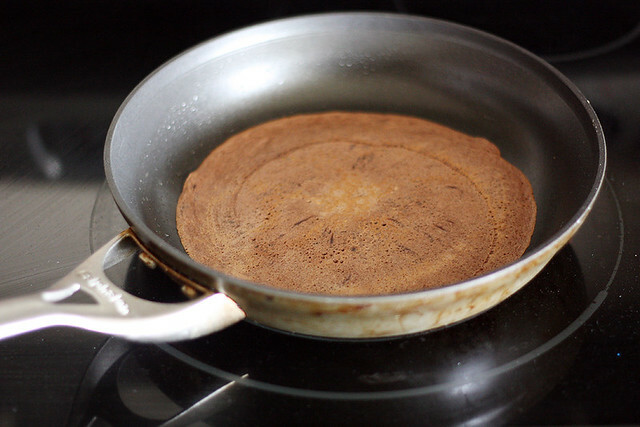 Too bad crepes are a serious weakness of mine…I think I need to purchase a new pan before attempting them yet. My nonsticks are not quite as nonstick as I’d like them to be! Wow, lady love – these crepes are the prettiest breakfast I’ve seen in awhile! I want one like yesterday. Oh my gosh, Liberte yogurt is my FAVORITE! It was one of the very first things I discovered when I first moved to Vermont. This looks amazing 🙂 Fun project! Natalie — I wish I’d discovered it earlier because it is SO GOOD. Thanks, doll! A big fan of chocolate for breakfast especially if it served with thick delicious yoghurt. Simply a perfect breakfast for two (or one very hungry girl). These sound and look so yummy I want to make up for my son’s 13th birthday for breakfast. can I use regular bleached flour and also can I use Hershey’s unsweetened cocoa powder? Crystal — Yes, you can use both bleached flour and regular cocoa powder. Hope your son enjoys them! Made these! Absolutely delicious! Perfect for a Sunday morning breakfast during a blizzard. YUM. My mix had little white lumps in it and although if didn’t change the taste they aren’t very pretty. Any suggestions? Halley — Hmm… I’m not sure! You can try sifting the flour before mixing it into the batter. Or, you can sift out the lumps before making the crepes. Hope that helps!